Summary: The objective of this study is to increase scientific knowledge of the genetic population structure of nesting loggerhead sea turtles in northwest Florida. This research will provide a more robust representation of the mtDNA haplotype ratios characteristic of this subpopulation. 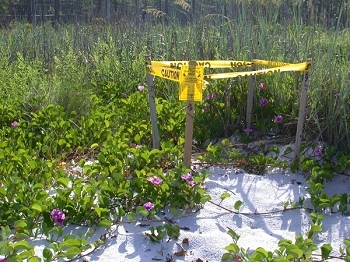 Since 1998, a saturation tagging study has conducted nightly tagging surveys of nesting loggerhead turtles on a 3-mile stretch of beach, owned by Eglin Air Force Base, in Cape San Blas, FL. Skin biopsy samples have been collected from individual nesting adults in this region since 2002, yielding a total of 46 tissue samples (n = 20, 16, 10, per year respectively). This is the most extensive tissue sampling effort conducted on the Florida Panhandle. The goal of this study is to provide a more accurate representation of the haplotype frequencies found in this region by sequencing the mtDNA control region of all samples collected through 2005.